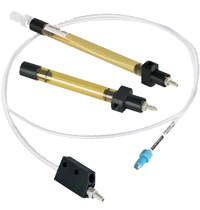 In many low pressure systems, such as diagnostic instruments, bubbles in the fluid stream can cause false detection readings and dispense anomalies. For these systems, the Systec® Active Debubbler captures and removes bubbles before they can affect the instrument or the results. Unlike passive bubble traps where bubble removal is dependent on backpressure, the Active Debubbler can be installed before or after a pump and provides consistent debubbling regardless of the system conditions.